This is a true matte polyester embroidery thread. Its high definition appearance adds dimension and clarity to designs. Due to its dying methods, Frosted Matt has an unmatched overall rating of fastness to light, making it ideal for embroidered items that will be in direct sunlight. Its polyester properties allow Frosted Matt to stand up to diluted bleach. You can stand out from the crowd with this unique embroidery thread from Madeira! 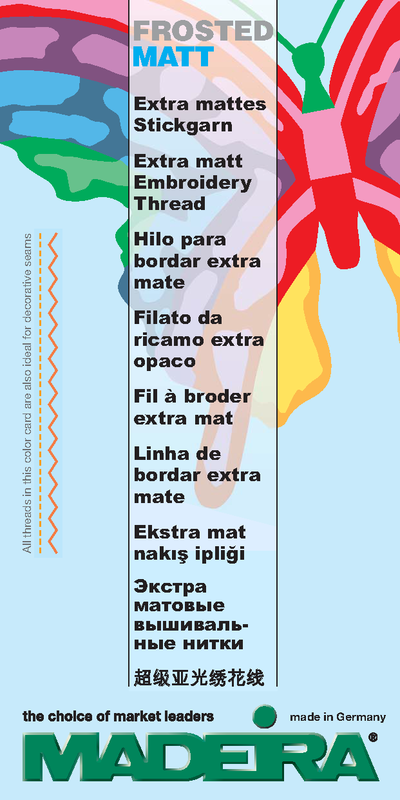 Helpful Hint: For best results when digitizing for Madeira’s Frosted Matt polyester thread, set the punch parameter to 3.5 or .35 to maximum 4.0 or .40 stitch density.